Just a couple months ago, we started a campaign driven by the core ideas behind Movember to help spread the awareness on male health issues. What started as a simple health awareness campaign quickly became something else. Raising funds… with a little help from our friends. During November 2013, we launched our own twist of the Movember campaign aiming to provide support to the ones who need it the most and getting help from our community of mobile developers in Guadalajara, Mexico where our global delivery center is located. The response was amazing! With the help of our partner in Mexico, Dawcons, together we were able to raise almost $30,000 Mexican Pesos ready to be destined to those in need. How did the campaign work? Pretty easily actually, we borrowed the Movember “Mo’ Bro” concept where our male developers and members of the community would shave their beards and grow a moustache as well as spread awareness about health issues. Then we would take a picture of the “Before” and “After” shot and post it on our Facebook page and ask people to like and spread the word about Movember, simple! We gathered more than almost 3,000 likes and for each of them iTexico and Dawcons stepped in and contributed $10 Mexican Pesos. In the end, the combined effort and help from our amazing community of entrepreneurs, mobile app developers, mobile designers, testers and many many others we were able to make a real difference in someone else’s life. Once the campaign concluded, we got the team and everyone involved in getting these funds and decided how we were going to use them to help out the community. We looked at several cases in local newspaper where charity cases are posted looking for someone to support them. Then we found a couple of cases that needed financial support to complete their medical treatment for cancer issues. That’s when he heard about the Fray Antonio Alcalde non-profit shelter, who host many people while they receive treatment for their illness. Since the Movember initiative focuses mainly on creating awareness on prostate cancer, we wanted to support people who were dealing not only prostate cancer but also other similar illness. That’s when we heard the stories of Yolanda, Jesus and Jose, three amazing people giving the best of themselves under the worst circumstances. 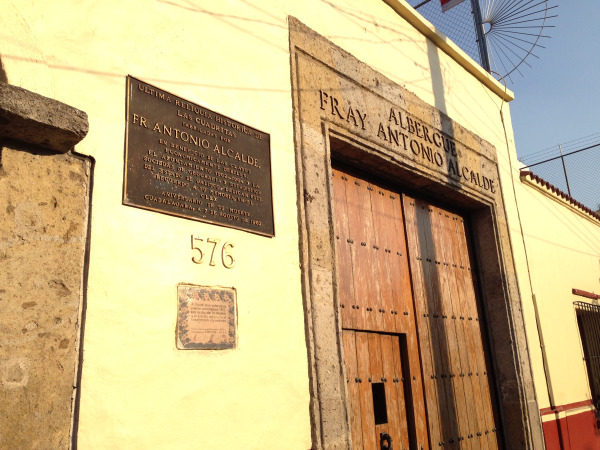 After we made the donation, we received a lot of gratitude from the people at Fray Antonio Alcalde, they told us that the people who received the donation wrote some letters for both companies. So we decided to make an appointment to meet them personally. We didn’t know what to expect at the beginning but at the moment that we crossed the main door we stepped into a whole world. An old yet beautiful, well-preserved building full of colors and activity accompanied by a warm welcome. Mariana, the social worker lead of Fay Antonio Shelter was so happy to meet us that she just couldn’t wait to introduce us to Yolanda and Jesus. First we met Jesus, a middle age man from a small town of Michoacan accompanied by his wife who greeted us with a big smile. Suddenly the whole effort became real. That point where all the effort and support of the people is reflected. It was such a good feeling that cannot be explained with words, it just felt great. Then we met Yolanda who prefers to be called by her middle name Gladis. 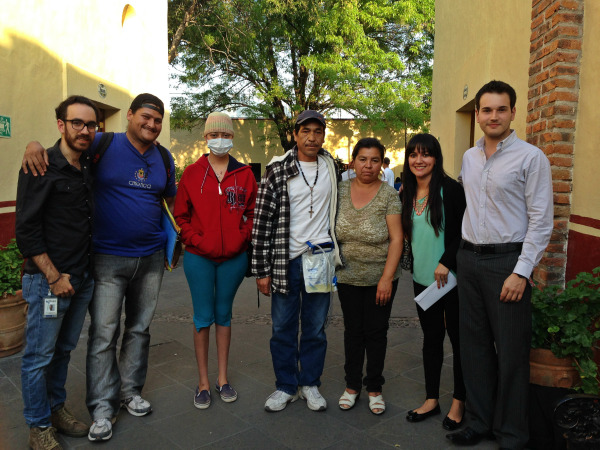 She is a shy girl from Puerto Vallarta who is only 19, a cruel age to be suffering leukemia. It’s impressive all the good attitude and the will to keep moving forward. She was also accompanied by her older brother who has been with her since the beginning of her illness. Everything became even more real, knowing that thanks to the medicines that the companies supplied for her treatment she was making a big progress. So we chatted with them for a while, listening to the stories of where they come, the amazing support of the family. Even we had some laughs! Something that lifts the spirit. And just before we started with the tour they gave us a personal letter that expressed their thanks to everyone at iTexico and Dawcons for the support during the campaign. Touching letters that we shared with all the team members. We thanked the organization for receiving us and having that unique experience. As we stepped out the doors, we knew that all the work and campaign was completely worth it. We are looking for new campaigns that the company can support and reach out to more people. We hope that soon you can hear from us and how can a “like” make a difference.